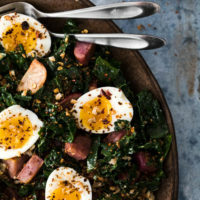 This hearty breakfast salad uses different parts of a traditional breakfast, all in a delicious kale salad. Soft-boiled eggs, roasted potatoes, and breadcrumbs all make for one delicious salad. Heat the oven to 400˚F. Quarter the fingerling potatoes and place on a sheet tray along with the minced garlic. Drizzle with olive and salt then toss until the potatoes are well coated. Roast until the potatoes are tender and starting to brown, 30 minutes or so. Combine the dressing in a small jar and shake until well combined. Place the kale in a bowl and drizzle with the dressing. Let rest until the potatoes are done. Once the potatoes are done and still slightly warm, assemble the salad. Add the potatoes to the kale along with half the breadcrumbs. Toss to combine. Place the eggs on top and sprinkle with remaining breadcrumbs and chili flakes as desired. Tips + Tricks: No breadcrumbs? Make your own by cutting/tearing a couple pieces of bread into chunks and toasting in a the oven along with the potatoes, for about 15 to 20 minutes (depending on the size of the bread pieces). Then whiz in a blender or food processor.